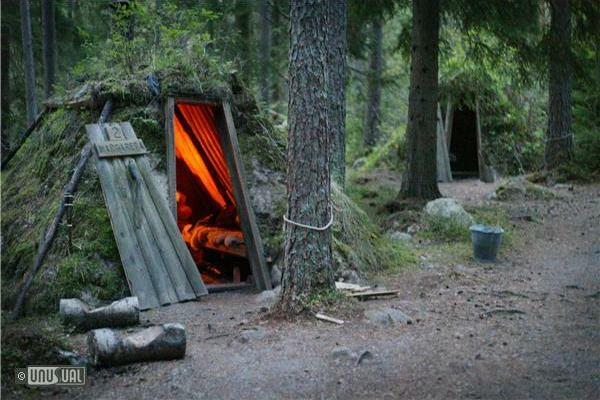 Kolarbyn consists of twelve little forest huts located by the beautiful lake Skärsjön. 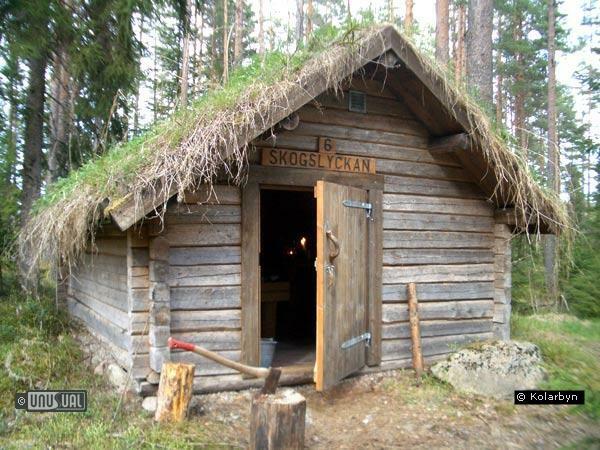 Called Sweden´s most primitive hotel, the huts have no electricity and the dark evenings are lit by candles or traditional oil lamps. Staying here is fantastic! There are blueberry bushes all around the site, so in summer you can pick the berries for your morning pancakes! 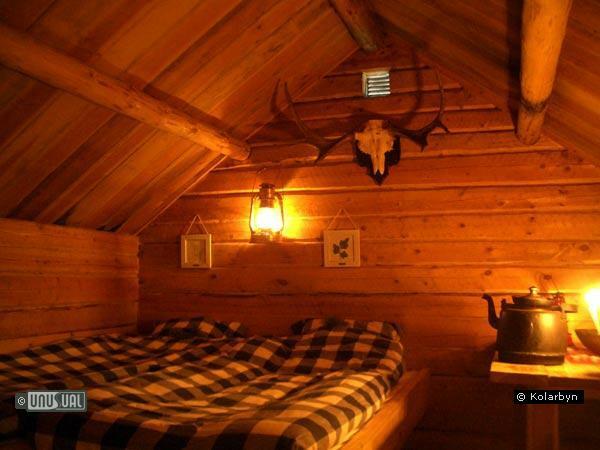 Each tiny hut provides two berths with sheep skin rugs to cushion your slumber. 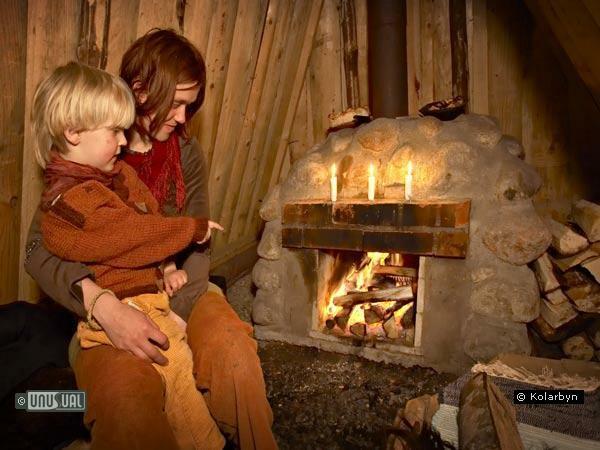 You are kept warm by a wood heater, with your first task to gather and chop adequate wood for your cooking and heating needs. During the week guests bring food to cook themselves at one of several fire places - one even has a view over lake Skärsjön. The nearest supermarket is in Skinnskatteberg 3 kilometers away - open 7/7 from 0800 - 2000. A limited stock of pans and cutlery is available in the storehouse, but we recommend you bring your own plates and cutlery. You're cooking on an open fire, so should either plan to barbeque/grill, or use one of the supplied pans. There are a couple of big kettles for hot water and making tea/coffee. At weekends, food can be provided for those making a reservation in advance. 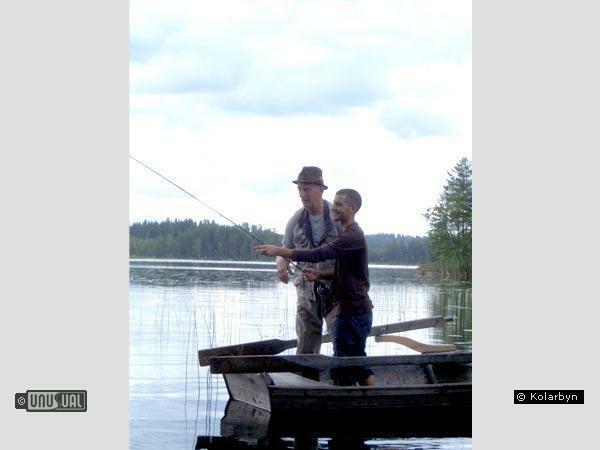 There is also a sauna to chop wood for, though as washing facilities are limited to a stream, you are encouraged to be brave enough to cool down with a dip in the nearby lake. 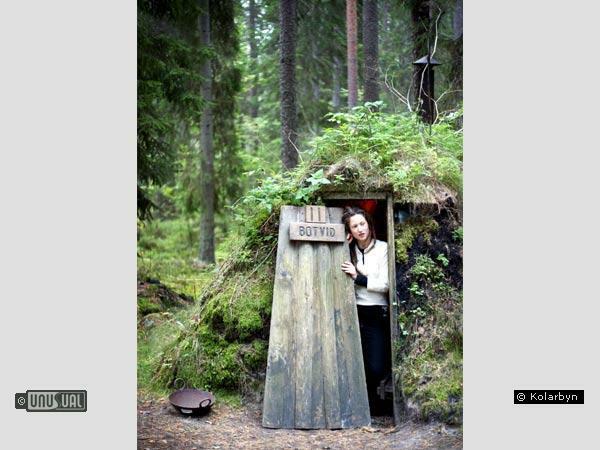 The toilet is in a natural outhouse, which though rustic, serves its purpose adequately, as was the normal practice for centuries! 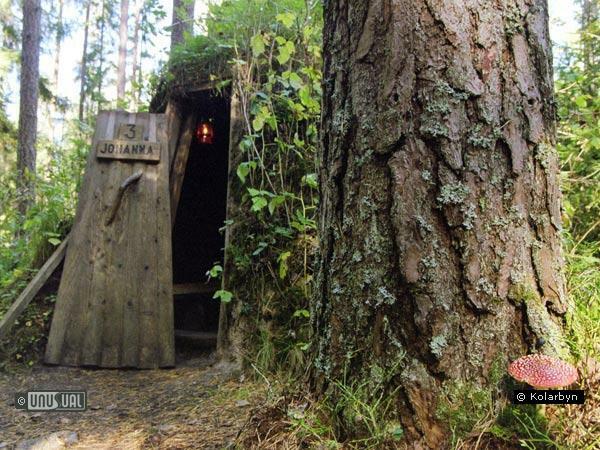 It has been decorated into a 'royal privy' and provides clean, candle-lit peace. 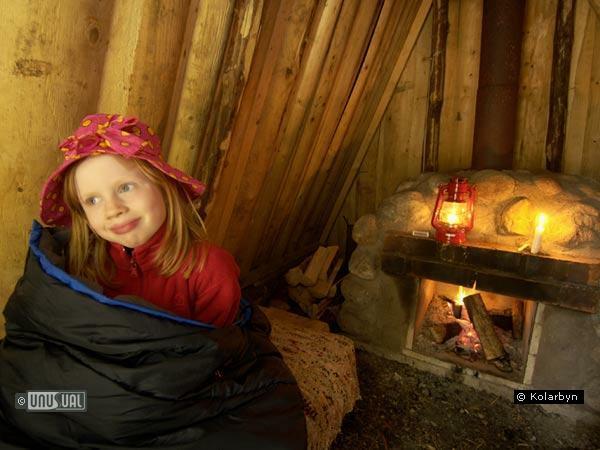 Pack warm clothing for cool evenings - and be prepared for a fantastic camping experience. Kolarbyn is a couple of hours by car from Stockholm and 60 minutes from Västerås. Alternatively trains run hourly from Stockholm Central Station to Köping where a connecting public bus runs to Skinnskatteberg for an arranged pick up by the Kolarbyn team. Total travel time is about 2 hours and 20 minutes. 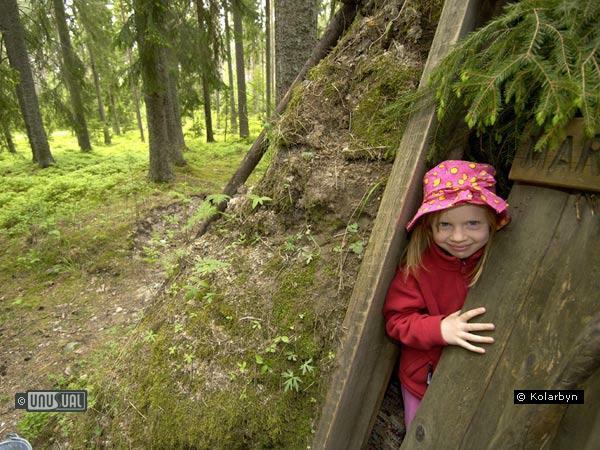 Providing a back-to-nature experience in the natural woods of Sweden, visitors can additionally book a number of guided excursions and even a romance package. Of particular note are the Moose Safari and Wolf Howling tours where you will learn about wild inhabitants of the forest in a practical way. Kolarbyn guides have been successful finding wild moose on every Moose Safari for the past five years. As night falls the forest is brought to life and moose awaken from their daytime slumber to feed. 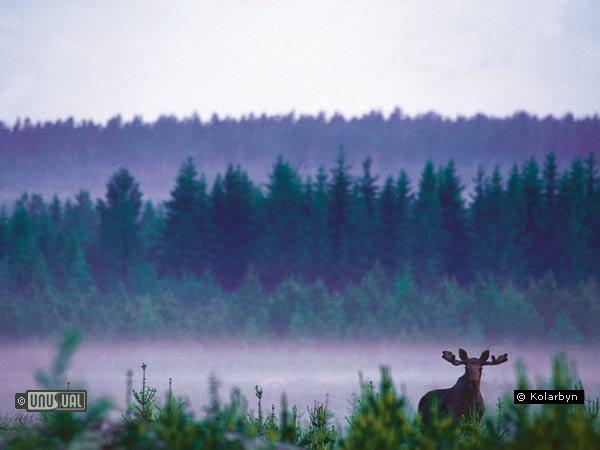 The animals seen are wild and it is through the identification of hoof prints, fresh droppings and bite marks plus knowledge of their favourite locations that the guides manage to find these kings of the Swedish forest. Very interesting and informative. Keep it up! Absolutely loved staying here, really magical, and the forest is one of the most beautiful places I have ever been to. Also went on the Moose Safari which was great, we saw 16 Moose. Thanks to Andreas and Marcus. This is a truly amazing place and so peaceful. Thomas and co were wonderful and the gourmet food for our stay in the 'luxury' lodge was superb. Canoe out and catch the sunset - it's a must. Kolarbyn is a place I will never forget. 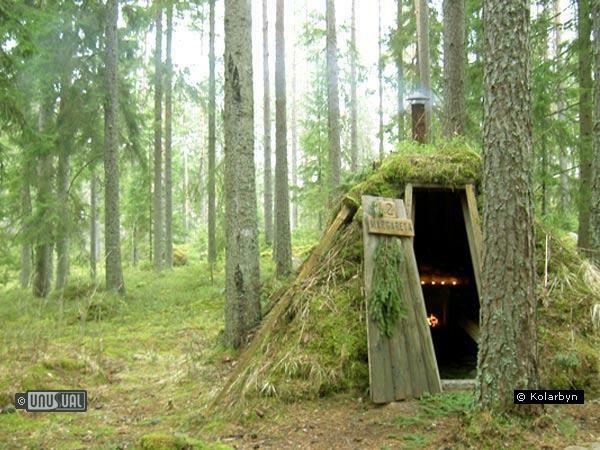 Living in one of the forest huts got me down to earth again. I realy had the chance to flee my hectic daily life. No electricity and no running warm water ... seemed shocking at first and I was a little sceptical yet it amazed me at last. It needs so little to make you happy ... a blueberrybush and an anthill gave me the kick. Yet, meeting the King of the forest, a full size moose in free nature was absolutely breathtaking. There are no better guides than the Kolarbyn Team in this area. They have unbelievable knowledge concerning their forest. After beeing on the mossesafari with 14 moose we sat around the fireplace. Marcus knows the best stories and Thomas makes a delicious three course meel over open fire. I'll come again! Next time I'll go on the wolvesafari. Have been to Kolarbyn a few times, last time with my son. Went for a combined elk- and wolfsafari. Excellent guide, lot of knowledge of animals and nature, and best of all - a perfect host and storyteller. As a guest you really get the feeling that you are unique in an unique nature! A very unusual bedroom and so exotic. Kindefull people, loving the nice nature. Recomeded to all who wants new good experience ! Arrived mid afternoon in time for a tour of the forest. Saw the spring (excellent water) before being sent to chop wood for cooking and the hut. Local supermarket open 7/7 until 8pm, so easy to buy ingredients for a log fire supper. Huts cosy and comfortable - sleeping bag rented was excellent. Kids had a lot of fun and slept really well. The morning was fantastic - with a walk and picnic to a nearby bathing spot. In the evening we met up with Mikael for Beaver Safari - and a local farmstead meal. Everything perfect. Thanks Thomas and Marcus!